Brian ‘Jock’ Bennett Crowned Employee of the Year at Godolphin Stud and Stable Staff Awards 2013. 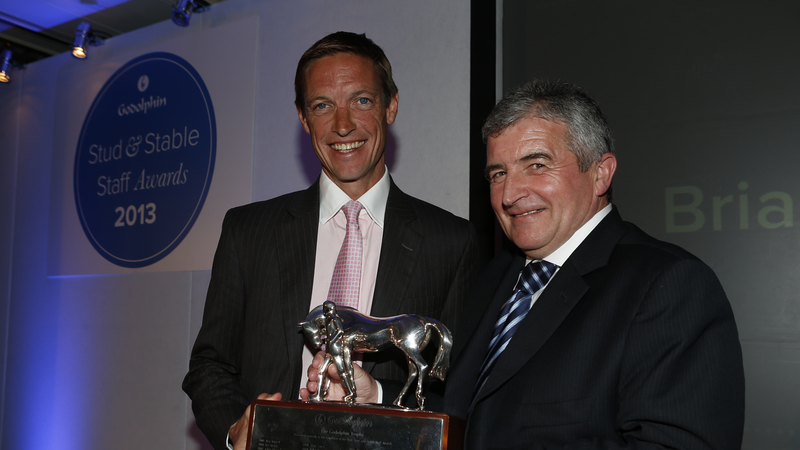 Brian ‘Jock’ Bennett was named Employee of the Year 2013 at the ninth annual Godolphin Stud and Stable Staff Awards Ceremony, which took place at the Jumeirah Carlton Tower Hotel in London’s Knightsbridge. The assistant trainer, employed by Mark Johnston, was presented with the perpetual Godolphin Trophy by presenter Clare Balding and special guest presenter Richard Hughes. Jock was also presented with a cheque for £30,000, of which £15,000 will be shared amongst the staff at the Johnston yard. In over 40 years of continuous service, Jock has worked for just two trainers. Among the highlights of his time with Bill Watts was travelling Teleprompter to the Arlington Million in 1985. Upon Watts’ retirement in 1997, Jock joined Mark Johnston Racing, initially as a yardman before taking up the role of assistant trainer. Each individual category winner collected £5,000, with their respective yard receiving the same amount to be shared between colleagues. The two runners-up in each category also received £2,000, with their yards also collecting the same amount. The winner of the David Nicholson Newcomer Award was awarded £2,000, with the same amount awarded to their yard, while the two runners-up received £1,000 each with the same amount awarded to their yard. Runners Up: Kevin Gossage, Stud Groom/Assistant Manager – Aislabie Stud; Gill Murphy, Second In Charge – Stowell Hill Stud.